I don't want to get into the house thing too much, but let's just say for now, that we had a change of heart. I will talk more about it soon, just don't want to jinx anything! So last night we went with Eric's parents to Mesa Rosa, and Bella did great! 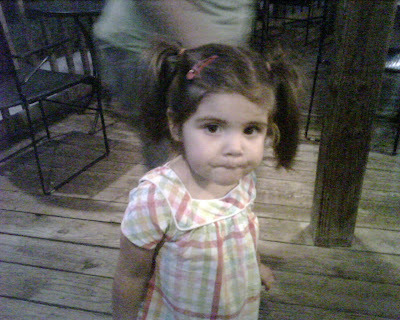 She looked adorable in her pigtails & cute outfit! After dinner we walked around the patio and let her look at the kitty that was lounging around (without touching! I am not a cat person!) We went home & Bella was fast asleep! It was a nice night and yet still very stressful / nervous night.